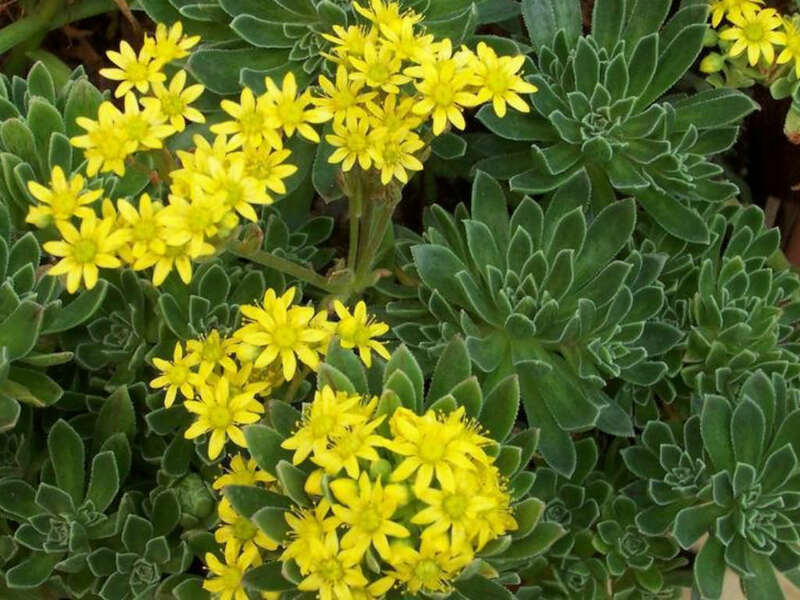 Aeonium simsii is a succulent plant up to 8 inches (20 cm) tall, with relatively small rosettes of leaves, but it branches prolifically to form a dense cushion of ground-hugging heads. 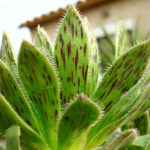 This makes it resemble the Sempervivums, as compared to the generally taller and leggier forms of many of the other species. 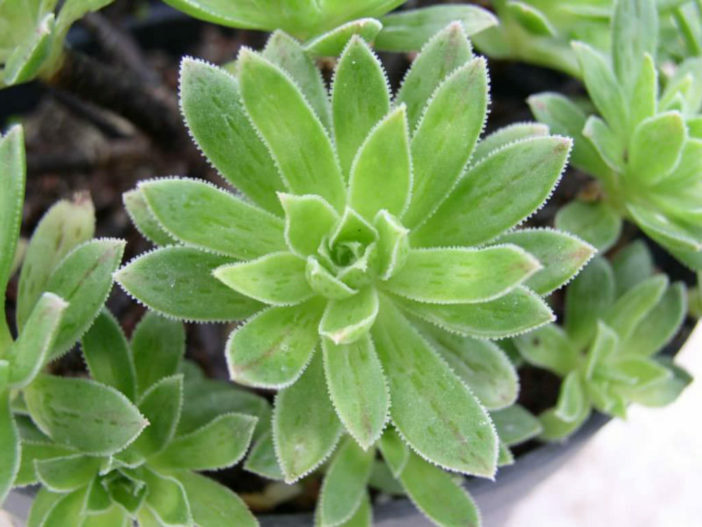 The bright green leaves are strap-shaped with pointed tips. The lower surface of the leaf is marked by many dark-green short lines running lengthwise, and the upper surface may sometimes have a purplish-brown line in the middle. 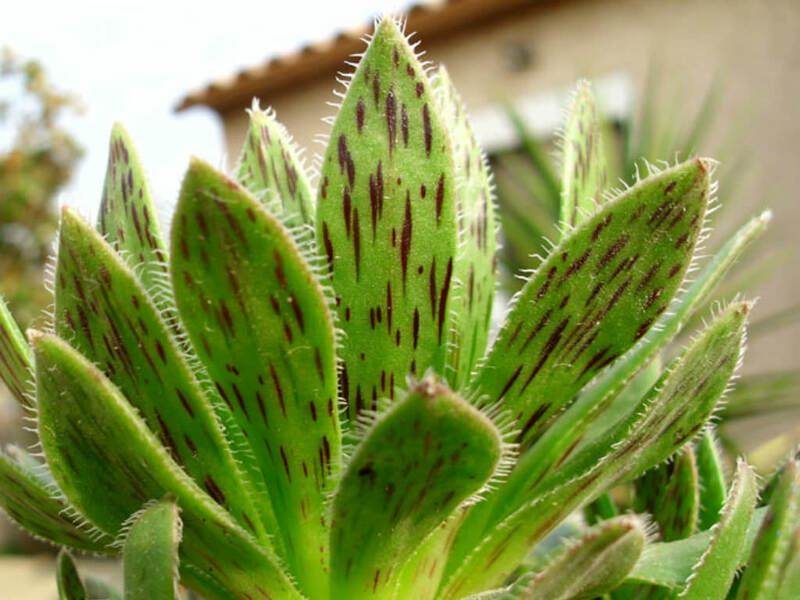 The leaf margins are lined with translucent cilia, giving them a fringed appearance. The inflorescences are of modest size and emerge in spring. 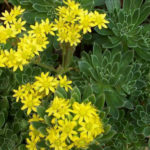 They bear flat-topped (or nearly so) clusters of yellow flowers. Aeoniums do not like really hot or dry weather. They may go dormant in summer and do not require any water, except in very dry conditions. In extreme heat, their leaves will curl, to prevent excessive water loss. Growing them in moist shade will keep them growing, but their true growth season is winter to spring, when temperatures are cool (65–75˚F / 18–24˚C) and damp. In the winter, water whenever the soil has dried out. Test by poking your finger down into the soil an inch or two. Too much moisture or allowing them to sit in wet soil will cause root rot. 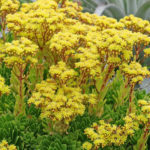 A sandy loam or regular potting mix is better than a mix specifically for cacti and succulents, since Aeonium need some moisture.. – See more at: How to Grow and Care for Aeonium. 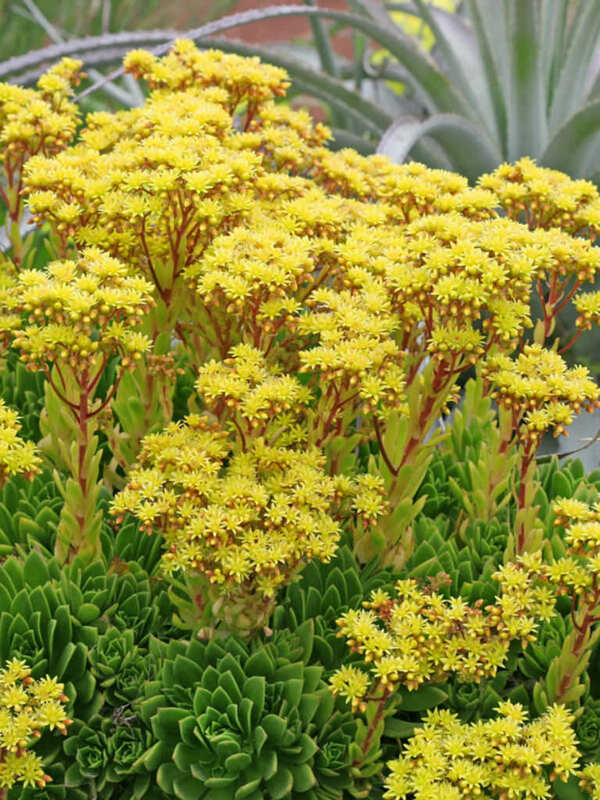 Aeonium simsii is native to Canary Islands.